One of the determining factors when choosing a domain name registrar is its ability to provide comprehensive, user-friendly and scalable management tools. Following 17 years of upgrades, our Extranet meets all of your front and back office needs. Packed with new features such as the option to add domains managed by other providers, our tool is one of the most accomplished on the market. An illustrated user guide is included, featuring more than 150 screenshots. You will always have the choice of whether or not you wish to use our Extranet site. You can also contact your dedicated Account Manager directly for advice. All program developments are done in-house in order to provide reliable, scalable and flexible solutions. Our Extranet is available in English and French, and allows you to manage all of the administrative data and technical settings associated with your domains. You can place orders, make transfers and renew domain names, view statistics, follow the status of your orders, retrieve and pay invoices, manage your sub-domains, configure your zone files, DNS servers and URL redirections. It is fully automated and available 24/7. For the efficient management of your subsidiaries’ or clients’ portfolios, several user levels are available with no limit to the number of accounts, including accounts for administrators, business units, delegated users and standard users. Our Extranet is secured by the highest security level SSL/EV encryption, and each account has its own logins. You can limit access to computers that are part of your network (through an IP address check) and allocate specific rights to each account by deciding, for instance, that your technicians should only have access to technical settings, your accountants to the financial management module, etc. 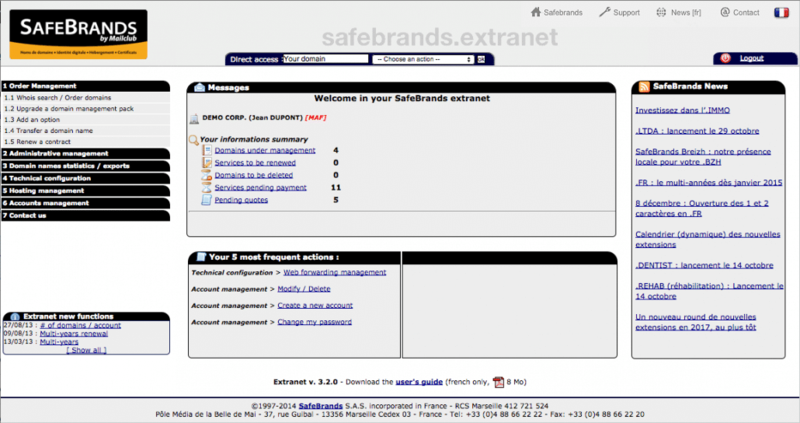 Our Extranet is a genuine online SaaS portfolio management tool. All of our clients receive a complete step-by-step user guide, illustrated with numerous screenshots to demonstrate the tool’s full capacity. The guide is available as a PDF file or as a hard copy for ease of use. Each MailClub Extranet page has an help feature ‒ simply click to open up a window containing tips and explanations for each page. Our teams are available at all times to provide phone support, and we can also organize training sessions at your offices tailored to your needs.